St James Cathedral sits on land that was given to the Anglican Church by the Crown in 1797. It is the Toronto's first Church. The brass eagle lectern has been here since 1889, currently standing between the Choir and the Lady Altar (the latter below the organ pipes) at the liturgical eastern end of the nave (but geographical north; the cathedral was built with an atypical north-south orientation). The present building is the fifth building. The land was taken from the traditional territories of the Wendat Huron, Haudenosaunee and Mississauga people of the New Credit. The Toronto Purchase was the surrender of lands in the Toronto area from the Mississaugas of New Credit to the British crown. An initial, disputed, agreement was made in 1787, in exchange for various items. The agreement was revisited in 1805, intended to clarify the area purchased. The 1787 purchase, according to British records was conducted on September 23, 1787, at the "Carrying-Place" of Bay of Quinte. The British crown and the Mississaugas of New Credit met to arrange for the surrender of lands along Lake Ontario for some money, 2,000 gun flints, 24 brass kettles, 120 mirrors, 24 laced hats, a bale of flowered flannel, and 96 gallons of rum. The agreement remained in dispute for over 200 years until 2010, when a settlement for the land was made between the Government of Canada and the Mississaugas for the land and other lands in the area. The history of the Cathedral dates back to the arrival of Simcoe to the site in 1793 and the holding of a service under the trees. The current building opened in 1853 after a major fire destroyed the earlier Cathedral and much of the original town. In 1807, the first church was built of wood. It was used in 1813 during the War of 1812 as a hospital and subsequently robbed and damaged by the American troops. Shortly after, in 1818, the church was enlarged and a bell tower addition was completed. The bell was used as a fire bell for the town. In 1833, the wooden structure was taken down and replaced by a stone structure in the Neoclassical style. In January 1839, the church burned down and was reconstructed. Upon reopening in December 1839, the church became a Cathedral. St. James Cemetery, the parish cemetery, was moved in the 1840s to St. James-the-Less at Parliament and Bloor, although there are still unmarked graves under the modern parking lot. 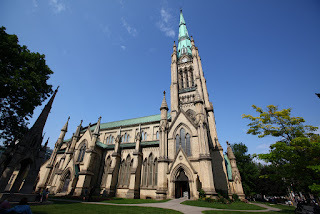 In 1849, the Cathedral was destroyed in the first Great Fire of Toronto. An international architectural competition was held to replace it, drawing eleven entries from Canada and the United States. Frederick William Cumberland and Thomas Ridout's Gothic Revival design placed first, followed by the submissions of John Ostell and Kivas Tully respectively. Construction began on July 1, 1850, and the Ohio stone and brick Cathedral was opened to the public in 1853. The church's original organ was built in 1853 by Samuel Russell Warren. Built from local brick and Ohio stone, the tower is the highest church tower in Canada and houses the only peal of 12 bells. The magnificent windows come from Germany, England, the United States, and Canada. The woodwork was created by the Jacques and Hay Company, including ceiling beams, pews, and organ pipe cases on south wall. The Chancel ceiling of gold leaf acanthus leaves was created by Gustaf Hahn and the Trinity banner in the Baptistry by Doris McCarthy. 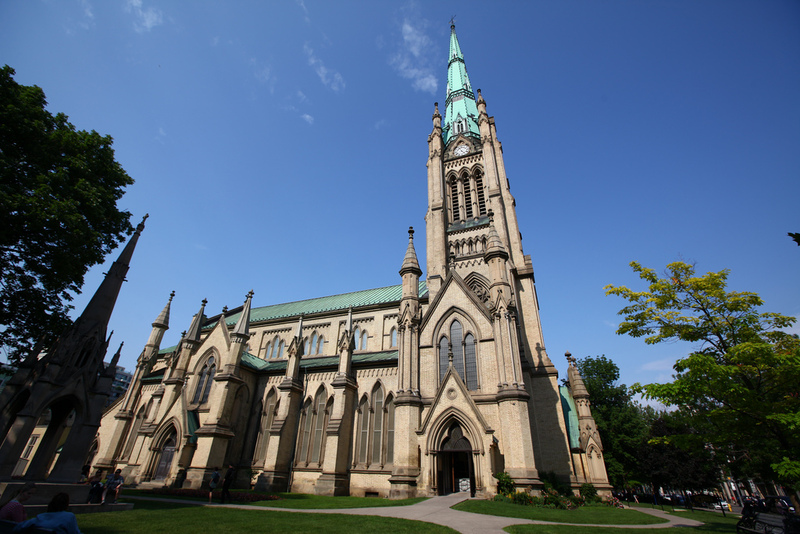 The church is designated under the Ontario Heritage Act and is the episcopal seat of the Anglican Church of Canada's Diocese of Toronto. To the east of the Cathedral is St. James Park, an urban public park that is owned by both the church and the City of Toronto. The park is bounded by the Cathedral to the west, Adelaide Street East to the north, Jarvis Street to the east and King Street to the south. It is located across King Street from St. Lawrence Hall. Created in the early 20th century (east and south sides around the park required demolition of a series of three-storey buildings seen above), the park's Postmodern landscaping is Victorian inspired with formal gardens and a water fountain. The cathedral is oriented on a north-south axis, whereas the traditional orientation is on an east-west axis with the altar at the east end. The orientation, decided by the design committee at the time, conforms to the symbolic representation of the church at the time, where the conflict with the American troops was apparent. The pews are oriented in central rows, with aisles on each side. The comfort of the seating was not highly regarded in the design. The organ has 5000 pipes and includes the original gallery organ from 1853 over the main south entrance at the rear of the cathedral. Trumpet pipes have since been added to the gallery organ. The front chancel and aisle pipes were added in 1916.